When I reviewed Jonathan Evison's The Revised Fundamentals of Caregiving I called it "a thought-provoking story about two men trying to do their best in a world that doesn't play fair." I noted that that B. 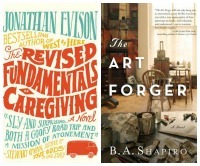 A. Shapiro's The Art Forger was "an engaging and successful literary thriller that will quickly rise to top of the genre." 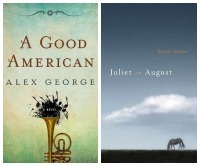 Here's what I wrote about these novels: "From the very first line ('Always, there was music') to the very last, Alex George's A Good American had my heart in its hands. It still does." "Be prepared: When reading [Dianne Warren's] Juliet in August, your physical world will seem to have disappeared; you won't be conscious of anything except what's happening in Juliet on a sunny August day." I wrote: "Unlike lighter books about women's relationships, [Thrity Umrigar's The World We Found] takes a more realistic look, highlighting what the friends cannot share as much as what they can." 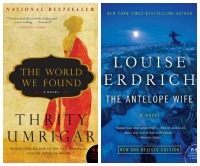 This edition of Louise Erdrich's The Antelope Wife is a complete reworking of an earlier, successful novel. I noted that "Erdrich's writing style is beautifully poetic, sometimes sparse, but always vivid." 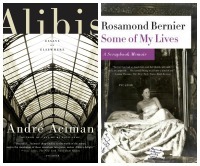 The art of the personal essay is alive and well: In Alibis, André Aciman "savors his journeys, sometimes pondering the impossibility of recapturing the past, and sometimes celebrating the special moments that do just that." In Some of My Lives: A Scrapbook Memoir, Rosamond Bernier's "intelligence, charm, and kindness shine through her stories, which just happen to be about Picasso, Henry Moore, and the Rothschilds." I've only read 2 of those books but will be reading The Art Forger soon. Such a wonderful list. I have read four of these books, but I'm sure they're all good. I love your Imprint Friday series! Good-lookin' choices. The Art Forger is high on my want list as are several others listed here. Good stuff! I've read 3 of the 12 you've listed, and several of the others are on my list! I hope to crack the spine on The Art Forger soon. Basically I look at this list and wonder what I spent my year reading. Happy New Year, friend! A fab list Beth -- thanks for sharing.I keep meaning to read Canada and am definitely going to buy it. Liking the look of several of the others too. What a fascinating collection of lesser-known reads from this year! And you have such a way with words! I really enjoyed your 1 sentence synopsis excerpts. You have made me want to take a closer look at many of these books. PS I just added many of these to my TBR list...and I am VERY picky about what I add to it these days since it is already so long! SO many great Imprint Friday books!! The Chaperone is the only one I've read, but The World We Found is near the top of my tbr pile and most of the others are on my wish list. You read SO many good books!! There are so many here that I want to read :) Hopefully get to them in the next year. 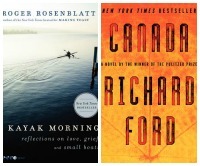 I've only read the two from Algonquin, but hope to get to many of the others eventually. Love your Imprint Fridays! I totally agree about some of these. In fact, a few of them made my best of list. 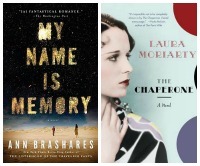 I have both The Art Forger on audio and The Chaperone that I plan to get to in January! An interesting way to approach your end of the year list! Nice list. I've read a few of these and liked them as well. neat! I plan to read The Art Forgerer. I have a few of these on my must-buy-soon lists - but the one I actually own is The Chaperone, and I really should get to it soon!